There’s been way too many stories in the news lately about Pitbull attacks – especially here in Portland, Oregon. So you can imagine how delighted I was to hear the story about D-boy, the Pitbull hero. 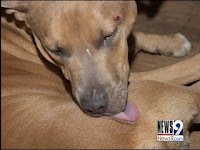 D-boy is the Oklahoma dog who came to the rescue of his family when a man burst through their front door. D-boy ran in from another room, but the intruder shot the dog twice in the head before he could get to the man. D-boy kept going, but he was shot a third time. The intruder, apparently spooked by the dog, ran out the front door. The good news is that D-boy survived – the veterinarian said it was his hard head that saved him! The family is safe,too, but now they are left with a large medical bill for D-boy. 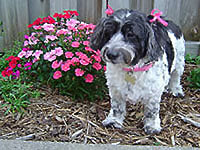 Visit this website to learn more about this wonderful dog.